Graham starts us off with a discussion of the role features play in the design of cameras. Features here are defined as non-essential elements that make the process of making a photograph easier (6:15). As an example, he and Nick run through the features associated with focusing. In the spirit of the thing, Nick talks about features that he would like to see developed that either has not already been implemented or have not been widely implemented (26:05). The hosts discuss the concept of a 35mm camera that could accommodate image sizes from 24mm by 24mm to 24mm by 65mm with several sizes in between (33:50). 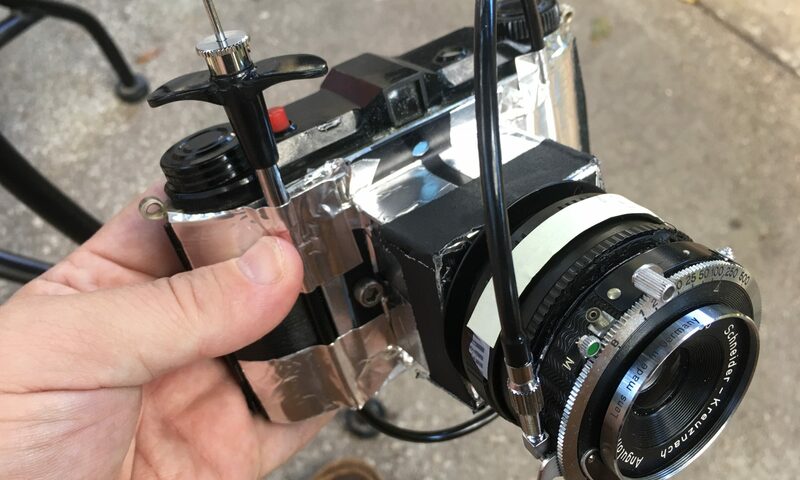 This camera would have a drop-in mask or a mask that is adjustable from the outside and would advance the proper distance no matter what format it is shooting at the time. Nick does his best to make the system much more complicated than the original vision but while providing a good argument on the merits of the additional complexity (46.30). Graham counters with the engineering and design process that takes many iterations to find the proper solution. They then start to talk about what features are desirable for this type of project (55:30). Nick tells the tale of taking apart his Nikanon scamera, shooting pinhole cameras and playing with putty (1:07:00). Zeb Andrews’ recent appearance on The Lensless Podcast sparked a discussion about slow shooting experiences and value of a photograph of an experience vs. the experience itself (1:31:00). They also discuss the IM Back digital back for film cameras as a core component of a camera build.